You are here: Home / Health / What causes depression in DOGS and how to HELP them ? What causes depression in DOGS and how to HELP them ? Dogs are strikingly similar to humans as far as emotions are concerned. Like humans, dogs too get depressed when things do not go as they wish. While, we can rationalise our feelings and seek a way out, our dogs are not so lucky…they need our love and care in such difficult times. “My dog is not active, not eating much, not playing, always tries to be alone in the corner of room, she shows no interest when I call, I guess she must be very sick, doctor please cure her” – this is a type of statement when a sick dog is brought to my clinic. I then examine the dog and may find all his vital signs normal – temperature, pulse rate, blood pressure and ECG – all appear just fine. Then why are these complaints becoming more and more common and why are these dogs withdrawn from their surroundings? That’s the time when I start talking to pet parents to understand the underlying problem. I ask them about their daily routine, their occupation, how their dog was brought home, who takes care of their dogs, when their dogs go outside and who plays with the doggy, etc, etc. 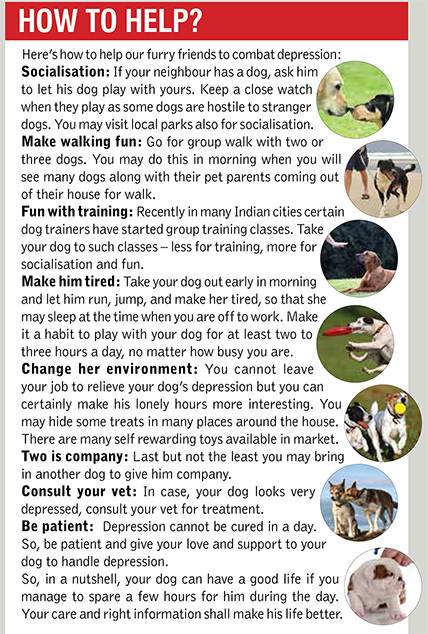 Then I get to understand the problem – these dogs are suffering from depression. 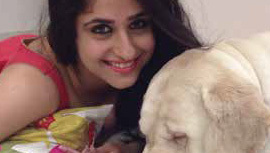 It almost always begins like this – “My son/daughter used to take care of our doggie, now that they have shifted to other city for higher studies, there is nobody to take care of our dog. We don’t even take our dog out for nature call as we get it done in our toilet, so our dog stays indoors all the time without any playmate.” So these poor guys, who are social animals, get rightfully depressed. What causes depression in dogs? Dogs are social animals but in modern times they are very isolated. They are bred in kennels and their litter gets separated at an early age of 35 to 45 days. These pups live in a house with humans as their companions. Most houses have only one dog in their house, with both parents on job and children to school. In such cases, doggies are forcibly left alone during the day time for 6 to 8 hours. Even in the evening, family members become busy in their work. Children play with dogs in early childhood but later become busy with their studies and other forms of entertainment. Thus, ignorance, isolation and inability to express their feelings take a toll on dog’s life. Depression signs to look out for? Appetite change: Some dogs, when depressed, may want to eat more and become obese. This is very common in Labradors living in apartments. They are retriever dogs and due to lack of exercise and boredom, they resort to eat more and become obese and lazy. On the other hand, there are some dogs who lose interest in food and eat less than before and become thinner. Sleeping all day: This is a very common symptom. You may be around him and want to play with him but he shows no interest and sleeps all the time. Lack of interest: Your dog may show lack of interest in normal activities which he used to like earlier, such as going out for a walk, playing with ball, etc. Paw licking or chewing: Dogs chew their paw when left alone out of boredom and they make it a severe wound. This habit evolves into OCD or obsessive compulsive disorder. Even after repeated dressing and innumerable visit to vet clinic and application of anti allergic medicines, etc, the wound in foot pad or between the toes don’t go away because problem lies elsewhere. Hiding: It is very common to find depressed dogs hiding deep under the bed where your hands can’t reach to fetch him. He wants to stay there so that nobody can disturb him. All the above signs happen to be there in many medical conditions as well, so it’s better to take your dog to vet for thorough examination before you can declare him “depressed”. http://www.dogsandpupsmagazine.com/wp-content/uploads/2016/03/Untitled-3-2.jpg 130 230 Dogs and pups Magazine http://www.dogsandpupsmagazine.com/wp-content/uploads/2017/05/1254nal.jpg Dogs and pups Magazine2016-03-18 12:07:482017-09-21 14:46:02What causes depression in DOGS and how to HELP them ?